For a writer, seeing your work in print is always a thrill. Isaac Blum, a student in the graduate creative writing program at Rutgers-Camden, experienced this exciting moment four times in 2012, with short stories and essays published in outlets such as Poetica Magazine, Humor Times, and The Oklahoma Review. The biggest thrill, however, came in October, when The New York Times published his essay, “Seeing Nature Through My Father’s Eyes.” Isaac says this moment was undoubtedly the highlight of his writing career thus far. He credits Rutgers-Camden faculty such as Lauren Grodstein, Associate Professor of English and Creative Writing, as being key to his development as a writer. “They really want to help you succeed and become a better writer,” he says. He is particularly appreciative of the practical knowledge the faculty impart – information about the publishing industry and the marketing of one’s work has proven to be especially helpful to this productive student. The support of faculty like Ms. Grodstein has allowed Isaac to confidently seek out publication opportunities – and ultimately succeed. The Tufts University alumnus and Bala Cynwyd native grew up knowing about Rutgers-Camden’s superior reputation – one of his close friends is the son of Dr. Janet Golden, Professor of History. “I knew that Rutgers-Camden was a close community, a small campus part of a larger university, a place surrounded by cultural opportunities,” he says. Being in a metropolitan area was important to Isaac, and Rutgers-Camden’s proximity to major cities like Philadelphia and New York was a selling point. He also knew of the creative writing program’s Visiting Writers Series, where critically acclaimed authors like Karen Russell and Gary Shteyngart come to campus to lead workshops and give readings of their work. 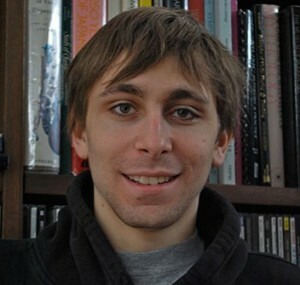 Such opportunity was invaluable, and he enrolled in the creative writing program in Fall 2011. As part of his degree requirements for the master of fine arts degree, Isaac was allowed one three-credit elective. He enrolled in Dr. Golden’s Readings in American History class, and was impressed by how much his writing improved because of this course. Precise, unambiguous language was a stressed principle, and he benefitted greatly. He also noticed how “everything on this campus is interconnected and the culture allows for intermingling.” The history program and the creative writing programs were not isolated, but supported and nurtured one another. Page last updated by Faculty of Arts and Sciences at 9:48 am August 10, 2017 . This page was printed from http://fas.camden.rutgers.edu/2013/02/06/isaac-blum/ at 1:37 AM Monday, April 22, 2019.